Apple updated its latest share count on Wednesday, putting the magic stock price at US$207.04 that would make the iPhone maker the first publicly listed US company valued at US$1 trillion. Apple said in a quarterly filing to the Securities and Exchange Commission, or SEC, that its share count was 4,829,926,000 on 20 July, less than the 4,842,917,000 it reported on Tuesday for the end of the June quarter. Apple's stock rose 5.89 per cent to a record-high close of US$201.50 on Wednesday following the company's better-than-expected quarterly results. 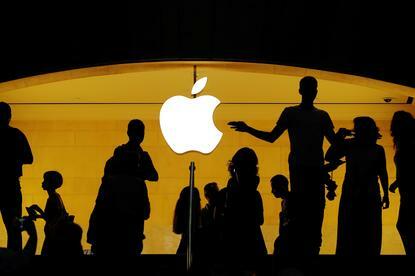 That would put Apple's stock market value at US$973 billion, based on its newly disclosed number of shares. With a mountain of overseas cash freed up by last year's sweeping US corporate tax cuts, Apple bought back a record US$43 billion of its own shares in the first six months of 2018, and its report to the SEC suggested it has continued that programme in recent weeks. A lower share count means Apple's stock must reach a higher price to reach a $1 trillion market capitalisation. Apple sold 41.3 million iPhones in the fiscal third quarter, half a million less than expected. But the average iPhone selling price topped expectations by US$30, hitting US$724. Morgan Stanley analysts raised their fourth-quarter iPhone shipment estimate by three per cent to 48.3 million and increased the mobile average selling price to US$720. The company's other products also did well in the third quarter, including its app store and Apple music. Analysts also expect the company to soon unveil a video service, which could take on leading streaming services like Netflix Inc and Amazon.com Inc's Prime. On a conference call on Tuesday, CEO Tim Cook hinted at a content project run by two prominent television executives hired from Sony Corp, without giving details. Of the 40 analysts covering the stock, 26 have a "buy" or higher rating and 14 are on "hold." The median price was US$210, pointing to a valuation of over US$1 trillion.